My husband and I were just looking forward to hearing some classic fifties songs performed with verve. We were certainly not disappointed, but there was more to the evening than that. 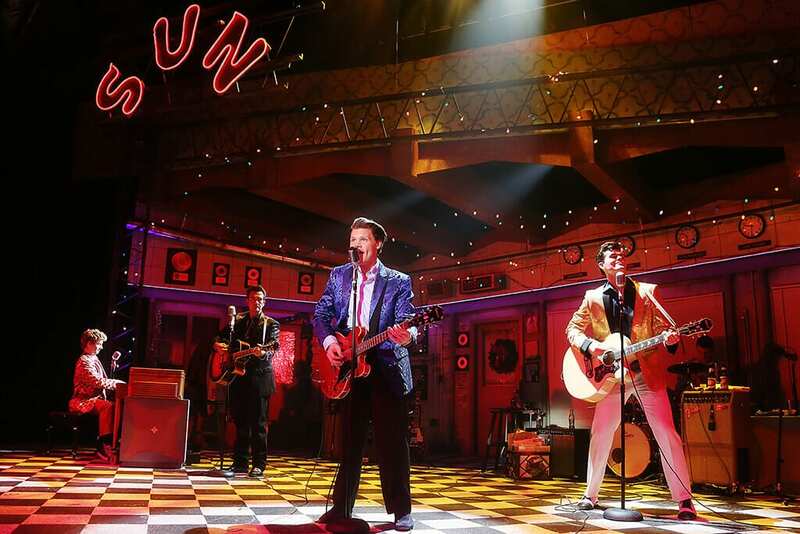 Million Dollar Quartet is based on a real recording session in 1956 with the never before, never again seen combination of Johnny Cash, Jerry Lee Lewis, Carl Perkins, and Elvis Presley. The actors are so convincing in bringing these iconic performers to life, at the moment when they pose for a group photograph, I feel the shiver of actually being in their presence. We get a Presley already successful, but longing for the early days of first fame. This Johnny Cash dreams of the money and artistic freedom promised by another recording studio. Jerry Lee Lewis, just starting out, is loose as a goose, funny and eccentric. Perkins appears desperate to hold onto the fame he has built. Each of them, despite obvious talent and passion, longs for something still out of reach. Two actors give exceptional performances. Sean McGibbon is quite funny as Jerry Lee Lewis, and his piano playing and vocals are exceptional. He elicits laughter from the audience with his quirky piano playing and dancing. Likewise, John Michael Presney’s guitar playing and vocals are formidable. His portrayal of Carl Perkins gives a real depth to his character and his interplay with McGibbon proves to be an interesting focal point throughout the performance. 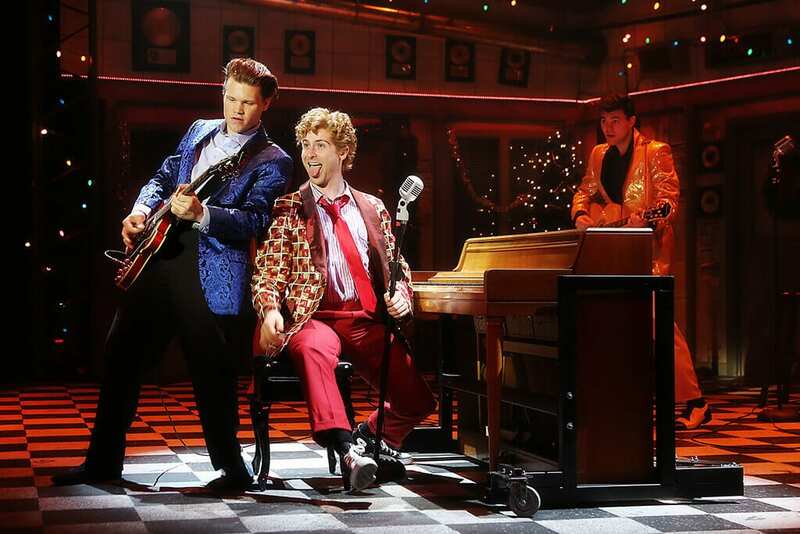 The actors act, yes, and sing, and dance, and play live instruments–quite well!–while they embody the story of the famous, unlikely recording session. The songs do not seem to be a direct reproduction of the track list from the actual recording session, but rather a selection of popular numbers from the years prior to the session. They were very popular with the audience though, so one can’t really quibble with the decision. The set invites us to relish each small detail of that small recording studio in December of 1956. The floor is a black-and white checkered tile that stands out against the muted tones of the walls, which are covered with awards and clocks and brightly lit by holiday lights. A decorated Christmas tree stands in the corner, out of the way of the instruments and recording equipment. We can make out a dimly-lit mixing booth behind glass windows behind the main set. 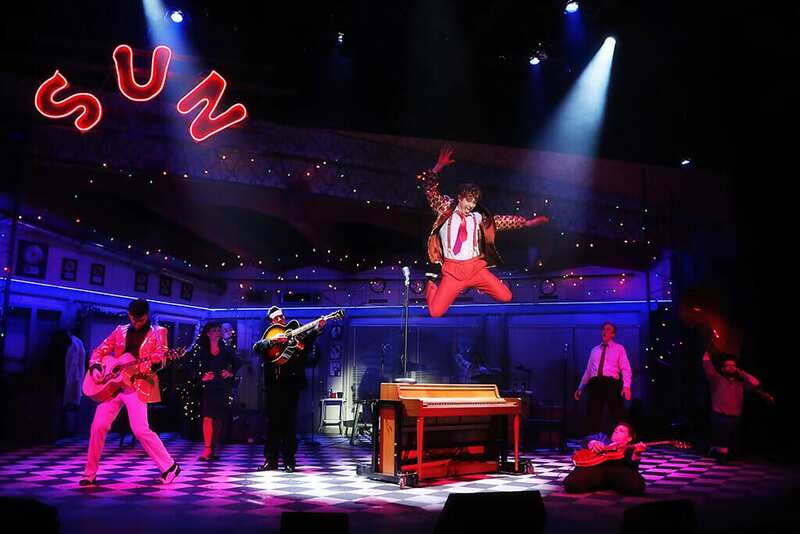 The company’s “SUN” sign “outside” the Sun Records studio, casts the stage in a red glow when illuminated. While the lighting conveys the changing mood effectively, there are a few struggles with sound throughout the evening. We had one microphone failure during the performance, pretty seamlessly replaced during the same scene. I do feel that several times throughout the performance, Trent Rowland’s vocals seem to be drowned out by the instruments. 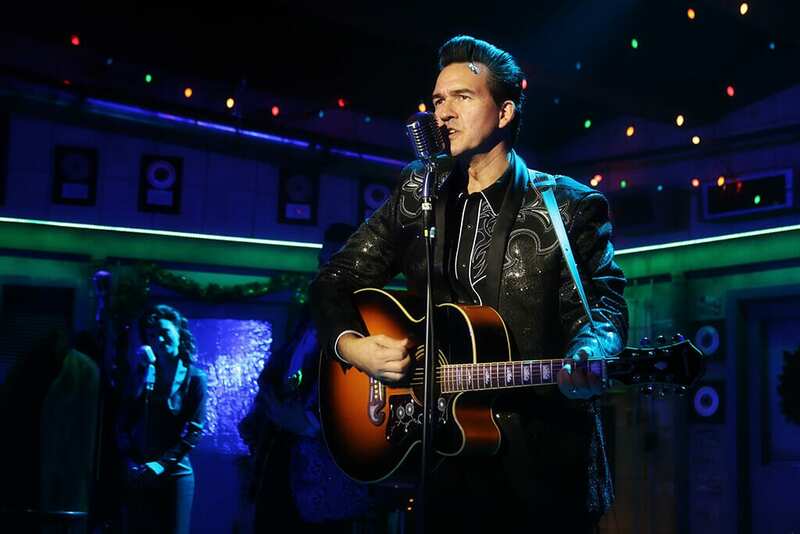 Still and all, the performance features an array of toe-tapping tunes that has almost every audience member on his or her feet for the final song. 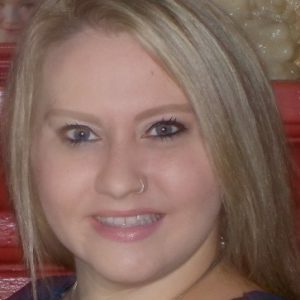 Million Dollar Quartet is a great date night or evening out with adult friends. Although it is not inappropriate for teenagers and older children, the full nostalgic fervor might be lost on them. It will, however, hold their attention. There are no boring moments. We are engaged from the moment the house lights dim until they come up again revealing our gleeful grins.